Who is ready for a garage sale?! Sarah’s Tip: Timing is Everything! 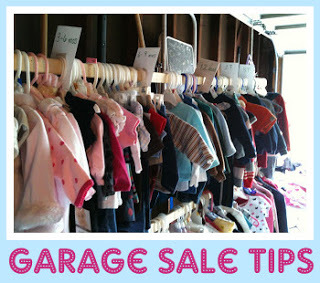 Do you know what day of the week is the prime garage sale day where you live? Our day here in this city is Thursday. I have lived in more rural areas where the day was “any day” or all weekend. Here, you might as well plan on Thursday being your big money making day, and Friday put everything half off or free, just to get rid of it! Another tip is plan your sale early on – as soon as the weather is nice. 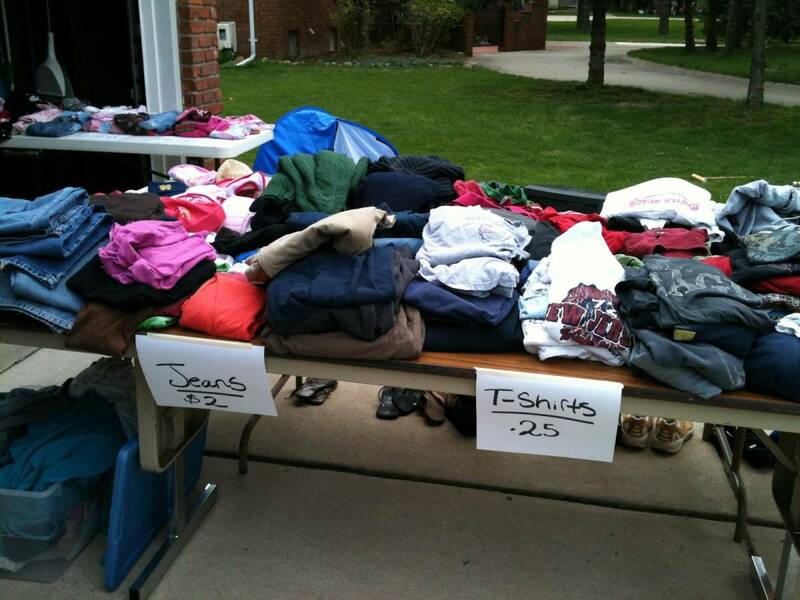 By the end of the Summer, most people are “garage saled out” and wont be as likely to stop. Start early in the day to attract serious shoppers. But be prepared! We usually advertise opening at 9am, but once we begin setting up at 7:30, the shoppers start rolling in and will dig through boxes before I’ve had the chance to personally open them. This can be a bit stressful, but should be expected! Check into what other local events are taking place. 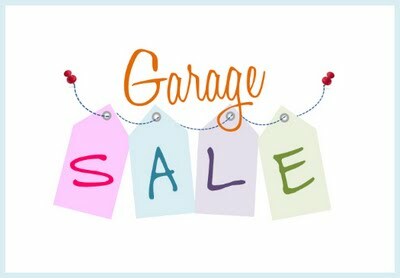 Does your subdivision or neighborhood have a designated weekend for garage sales? If so, take advantage of these times. Don’t schedule your sale at a time that will conflict with another big event – unless of course the traffic from that event will help your sale! Be sure to check into your city’s garage sale policies, whether a permit is required and if there are certain days you are not allowed to hold sales. People will buy more when they can find what they are looking for. Sarah took two long boards and used twine to tie them together and then to the ceiling of the garage. Once the clothes were hung and separated by age and gender I took large, index cards and wrote sizes on both sides of them (front and back). I cut a section out of the card that was the same size of the board. 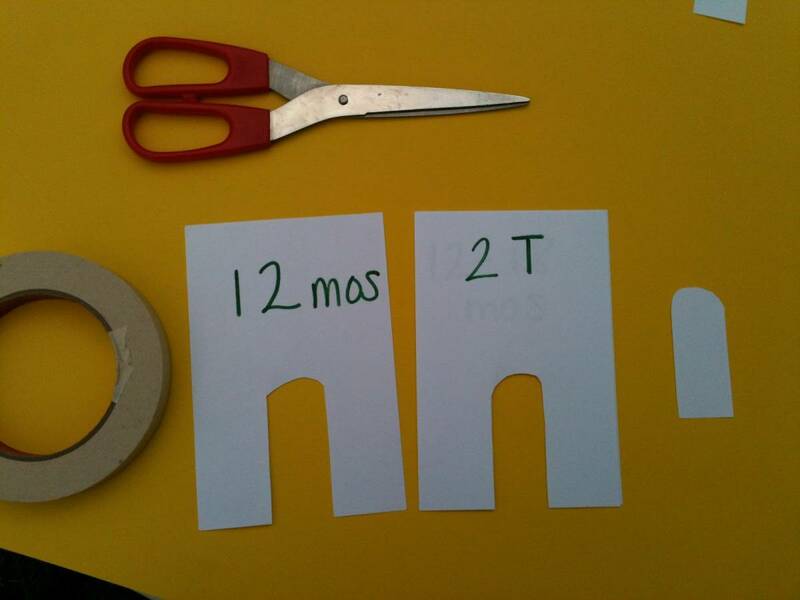 Then I taped the section I cut out across the bottom so card would stay on the board. You could also visit Mother’s Niche for some awesome, Printable Size Dividers! It makes a HUGE difference when I’ve advertised on craigslist. Around here, that is where most people check for garage sale listings. Maybe near you, it’s the newspaper or another local on-line message board. Be specific, list specific items, sizes, quantity, prices, etc. I would say 90% of the people that stopped at our most resent sale, saw our listing on craigslist. Many came with my advertisement in hand, to look for specific items I had noted. Many traveled from up to an hour away, just because I had posted pictures of how well organized everything was! Also, be sure to clearly mark your sale with signs. Make them easy to read and eye catching. We found some very nice signs and foam, poster boards at the Dollar Tree. We also put balloons with the sign on the road, and balloons in our front yard. Keep it Simple!! I made 2 batches of chocolate chip cookie bars, brownies, and banana chocolate chip bread. I used 9×13 pans and cut them into 9 large pieces. I bagged them in sandwich bags the night before and put those in rubbermaid containers. That way I didn’t have the added expense of ziplock bags, but also had fresh baked goods. I priced everything at a dollar except the banana bread. I made mini loaves and sold those for $3. Bottled water with ice in a cooler is also a great addition for $1 each. 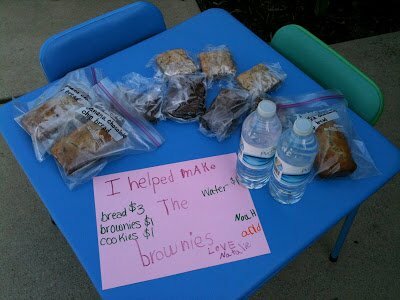 I sold out of the banana bread and brownies. Those were the two easiest things for me to make. And the water is a no brainer. We asked shoppers if they wanted a brownie or a water when they were making their purchases. If older guests came and said, “There isn’t anything here for me.” We would say, except brownies or cookies. Sometimes people would buy and sometimes they wouldn’t. But that is sales. You can’t be afraid of rejection. After expenses I made, approximately $30 of which I gave $7 to Natalie (the amount she stayed around to collect) and the rest paid for gas down to visit Jay and Sarah :) All leftovers were gladly eaten by all of us. 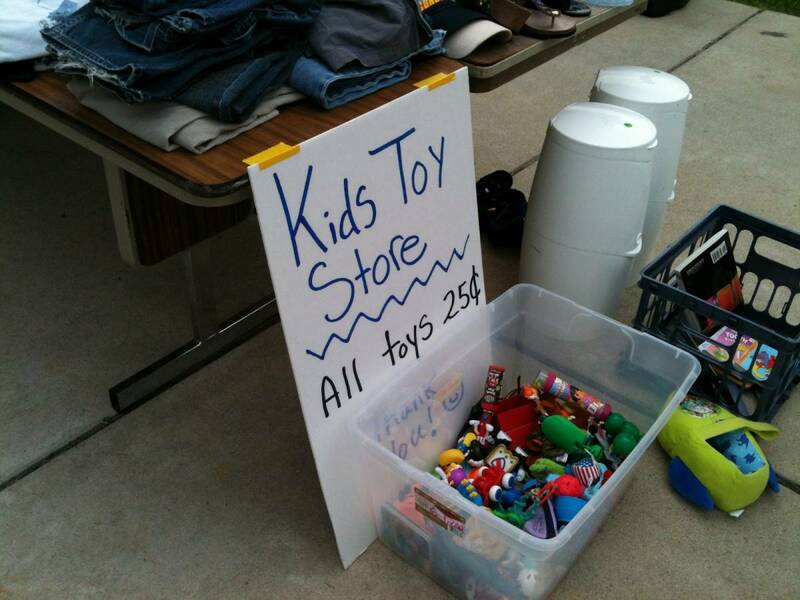 The key to a successful garage sale is knowing how to price things. I always think about what I would be willing to pay for each item. What would be considered a really good deal, based on the quality of the item. I want to price things as high as possible, but low enough to be considered a good deal. I ultimately want to sell stuff and get rid of things, rather than have an item picked up 20 times yet never bought. Sometimes, a low price that almost makes you cringe is ultimately the best, in the long run, if that’s what it takes to sell. Bundle things together and price them as a set/package deal. If things are clean and organized, you can ask a higher price. Be prepared to make deals and bargain with people. Determine ahead of time how low you are willing to go on certain items – otherwise you may panic when someone throws an offer at you. People will be fairly understanding of your unwillingness to bargain if it’s early on, the first day. But later in the day or on the second day, make getting rid of stuff your primary goal and drop your prices as low as possible to make a sale! 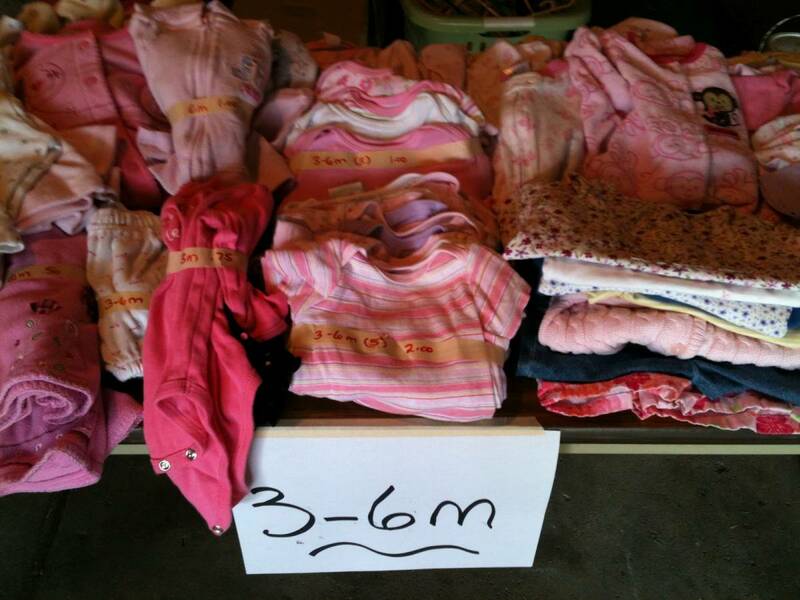 I price really nice stuff individually, others I list on a poster (shorts $.25, t-shirts $.25, long sleeves $.50, dresses/rompers $1, pants $1, etc). 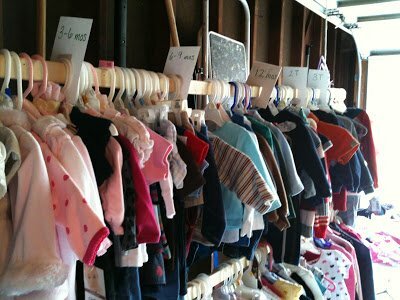 Baby gear I list at around $10/each. Sometimes individual items can be sold at a higher price on Amazon or craigslist – I’ll price these higher and if they don’t sell, I’ll list them later on. A $.25 kids toy area is a great thing for one main reason – it will keep kids of every age pretty entertained while their parents shop! Also, if possible, don’t price things at 75 cents. This was an afterthought for me when I realized how much more complicated it is to add in the cost of 75 cent items. When you have a line of people waiting to pay and a women with a pile of children’s clothes in her arms, you want to add things up very quickly. You can do all the planning in the world, but if you don’t have traffic you will be discouraged. Have you seen the signs on the corner only to find you turning down several roads before you get to the house. This seems like a no brainer, but if the location is up for debate always choose the house closest to the busiest road. Your results will be much better. Garage sales are much more bearable and almost enjoyable when doing them with a friend! This year, Julia and her family showed up bright and early on the first day, just as things were beginning to get crazy. I was running around like a chicken with it’s head cut off, when Julia swooped in and helped pick up the pieces. She quickly began pricing things that had yet to be priced, organizing things that had been thrown about haphazardly, set up a check-out station and started making signs. 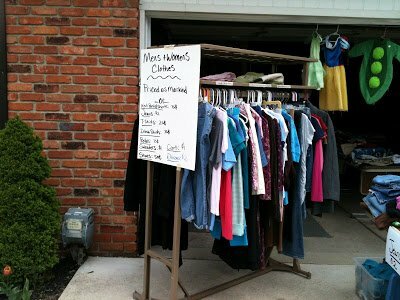 When a friend or family member is involved, you can also advertise a “multi-family sale” which attracts extra attention because it means more items and greater variety at your sale. 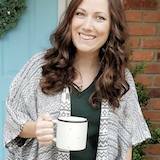 Mark each item with initials and keep track of them at check-out by running a tally in a notebook – or set up your sale like a flea market and allow individuals to man their own tables. Group electronic items together and have a power outlet handy. No one wants to buy a toaster or a TV if they can’t tell that it works properly. Better yet, have TV’s turned on and hooked to an antenna or DVD player to show the screen and sound is in tact. Be prepared with bags, boxes and cash for making change. Other things that are helpful to keep within reach: masking tape and a permanent marker. Be prepared to bargain… and let go. For other great tips, visit I Heart Organizing. 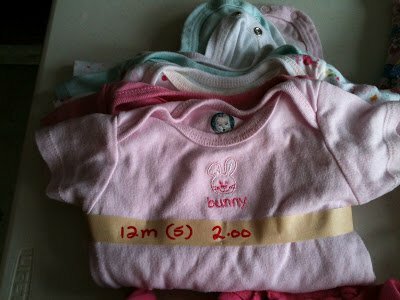 I love the adorable signs she created and colorful price sheets. So easy to do (just add cute colors), why didn’t I think of that? ?